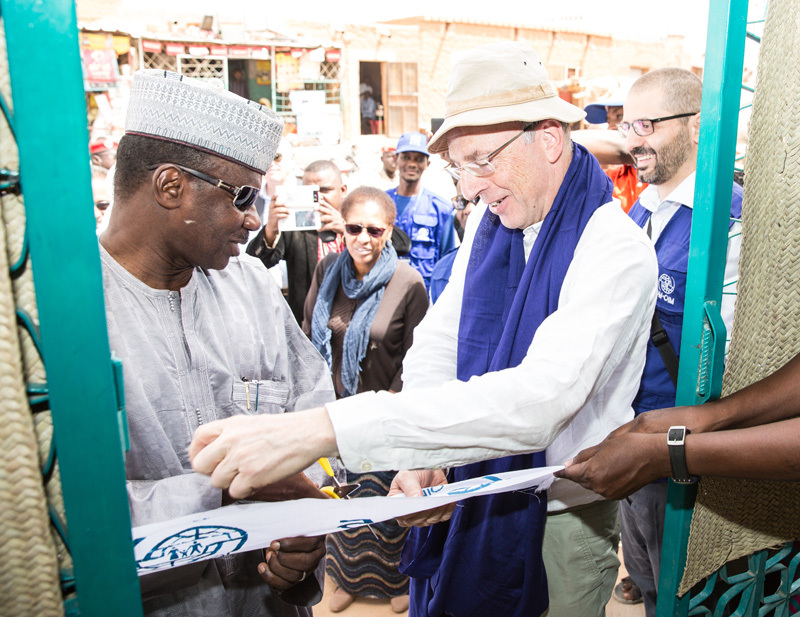 Niger - IOM Niger has inaugurated a migrant information office in the town of Agadez in the Sahara, a hub for West African migrants travelling to Libya, Algeria and Europe. The office was formally opened by IOM Council Chair Ambassador Bertrand De Crombrugghe of Belgium. The office will provide information and counselling to potential migrants, migrants in transit and returnees to Niger. The initiative is part of IOM’s Migrant Resource and Response Mechanism (MRRM) and is funded by the European Union and UK DFID. It aims to improve migrants’ understanding of the risks and dangers associated with irregular migration and how to migrate in a safer and regular way. It also points migrants towards available legal migration channels and educates them on their rights and obligations, as well as those of States. It can also provide direct assistance. This week it identified and assisted a victim of trafficking from Nigeria. “The main beneficiaries are migrants on their way to Libya and Algeria. The office is unique in that it does not just discourage people from leaving. It also plays a proactive role in reaching out to migrants coming back and sharing their information with those who want to go. It can help them to make better informed migration decisions,” said IOM Niger Chief of Mission Giuseppe Loprete. The office is linked to an IOM information campaign “Supporting Informed Migration Decisions in Niger”, co-funded by the European Union and the Italian Ministry of Interior. Niger represents one of the last stops of a long journey that West African migrants undertake before leaving the region on route to North Africa and Europe. The Nigerien authorities estimate that between 120,000 and 150,000 migrants will transit Niger in 2016, mostly coming from West Africa and heading to Libya and Algeria via the Agadez region. “Niger is well known for its stability in the region. These migrants in transit may generate new job opportunities and contribute to income generation and the national economy. But Niger still needs to meet the challenge of recording who is entering the country and their countries of origin, as many of them have no identity documents,” said Ambassador De Crombrugghe. During his three days visit to the country, Ambassador De Crombrugghe also visited IOM’s Transit Centre in Agadez and met with Niger Prime Minister Brigi Rafini, the Sultan of Aïr and the EU Delegation. Before leaving for Mali, he also visited the border with Burkina Faso, where a frontier police post is currently being rehabilitated by IOM.